Mike and I sometimes eat at Razzi’s Pizzeria in Greenwood because they have whole separate menus for omnivores and vegans (and another for gluten-free folks, too) and we can both have calzones when we’re in the mood for a treat. 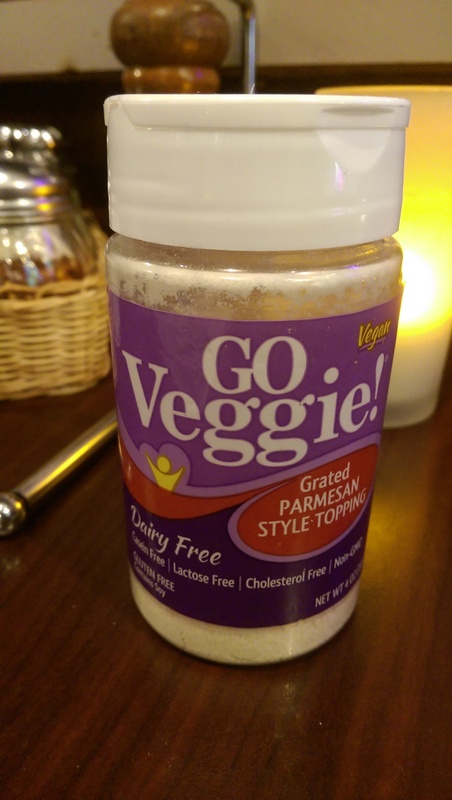 I’ve never tried the Go Veggie! parm before. I use my own homemade Happy Herbivore parm when I cook at home. It was delicious! I haven’t quite tasted that flavor in a very long time and it was a welcome topping to my vegan calzone. Here’s to hoping vegan parmesan shows up on every table in America. Well hello there. I hope you’ve had a lovely summer. I’ve continued to cook away in a constant struggle to keep up with all the beautiful goods coming through my kitchen via CSA. Let’s review what I’ve come up with in the past several weeks. I’m a pickle whore, no joke. My whole life. So it’s been fun to work up some quick pickles with the pickling cucumbers that I’ve received and especially the radishes when I don’t have time or ideas for anything special for them. The radishes are perfect to have on hand for salad fixins. Pickled radishes. Amazing in salads.